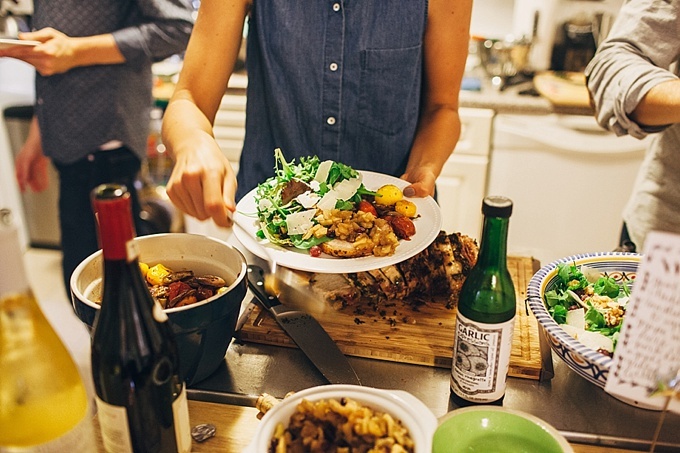 Last summer, we were chosen by FEED to be one of their featured fall FEED Suppers. The idea is that each guest makes a donation to FEED to provide meals to people in need. Learn more about FEED's mission and FEED Suppers here! Our dinner party was a family affair - Stephanie and I styled and planned everything, I did the calligraphy and our husbands were our master chefs for the evening. Thanks to the fabulous Autumn Kern, of We Are The Kerns, for making the trip out to NYC for our supper party! We had a computer set up as a “giving station” - people came asking about the cause and we had the opportunity to talk about it while they were making their donations. This made giving feel natural and more integrated into the supper. Thanks again to We Are The Kerns for documenting our FEED Supper!